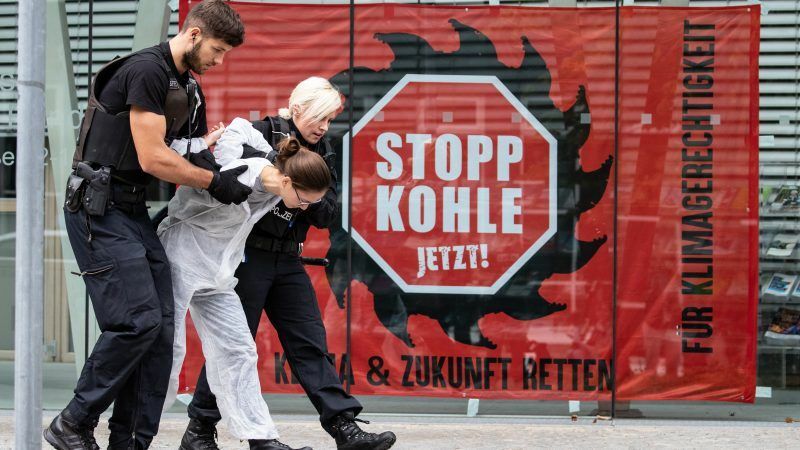 On Saturday, as top climate scientists were putting the final touches to the latest shattering UN report on climate science, thousands of people were protesting against the expansion of one of Europe’s biggest, dirtiest coalmines, writes Jagoda Munic. If the new IPCC report tells us anything, it’s that the fossil fuel age has to end – and that we must massively and urgently transform our society to kick our fossil fuel addiction. It means that the time to phase out coal and other fossil fuels in a socially fair way is now – not tomorrow, not next week and not decades from now. It means that the space for manoeuvre and compromise on decarbonising by rich nations is closed: we can no longer afford for climate to be falsely ‘balanced’ against other interests like profit. From now on, going fossil-free must win out every time. Preventing climate catastrophe and temperature rises of 1.5 degrees or more is a matter of life and death for millions. Climate change is already claiming victims; these are disproportionately victims who’ve never flown a plane, bought an iPad, or had the benefits of a western style consumer lifestyle; victims who cannot afford to live in adequate homes resilient to heatwave, or in streets whose air is clean. Rich Europe, which has caused so much of the greenhouse gas emissions now in the atmosphere, bears a particular responsibility to do its fair share and must end its fossil fuel addiction even sooner. The EU is making incremental progress on climate change and is considering nudging its 2050 carbon reduction target upwards. But the IPCC shows incrementalism is no longer enough. Going to ‘net zero’ by 2050, the most ambitious proposal under consideration, is simply too late for Europe to stop burning carbon (and still does not represent zero fossil fuels). Meanwhile, the EU continues to invest in new fossil fuel infrastructure – including for new gas pipelines and supply lines for American gas; it is still using taxpayers’ money to subsidise coal and other fossil energy plants to sit on standby, and expand airports. The new EU budget, with no fossil-free guarantee, also gambles on building more fossil fuel infrastructure well into the next decade. The EU talks a good climate talk: but its words will not be enough to stop it from killing the climate. To see the appropriate response to the IPCC findings, look to the protestors in Hambach who are making gains. Look to the communities all over Europe who have successfully resisted fracking. Or the mass movement to shut down the failing gas field in Groningen (Netherlands). Or the citizens who are building their own community renewable energy projects all over Europe. These and countless other acts of liberation from fossil fuels need to be supported, because without their success, humanity has no future. The future of the EU relies on it being relevant to solving mammoth problems for citizens, like climate change. It can offer a pathway to radical transformation, and towards hope out of despair. The solutions are there and can benefit EU citizens: ever cheaper renewable energy, passive decent housing, better public transport and green jobs. Now the investment and political will must match the scale of the fossil-free challenge. Let’s start using hydrogen that can be transported through our current natural gas pipe system going to the millions of homes, in particular in The Netherlands. The costs to convert from gas to hydrogen are minimal for the households and the governments “just” need to build a few “electrolyzer” factories, that will convert electricity in hydrogen. In 2025 we will have enough “green” electricity to make hydrogen… So let’s start building these factories now!